As an entertainment writer and music maven, one of the first things I want to know when I travel is where to find live music. Fortunately, I don’t always have to go far to find it. You see, locals know that our area is teeming with live tunes – and I’m here to share my insider tips. Whether you like your live music indoors or outdoors, lively or low-key, or a mix of all of the above, Wilmington and its beaches have you covered. From waterfront stages and historic halls to lively breweries and festivals, there’s plenty of places where you can enjoy some tunes. So get ready to get fluent in music’s universal language on your next coastal getaway. If you like stunning sights with your songs, then any one of the area’s outdoor venues is a best bet. Wilmington – Hugh Morton Amphitheater at Greenfield Lake Park hosts regional and national acts in a picturesque lakefront setting. Artists from Warren Haynes and Tift Merritt to Michael Franti & Spearhead and the legendary Willie Nelson have played the popular venue, which offers seated and standing-view options. New to the scene is the event stage at Port City Marina which hosted Dwight Yoakam and Aaron Lewis concerts. Perched atop a riverfront pier, the sound stage—nearly surrounded by water— also hosts local acts. Meanwhile, seasonal options include the Downtown Sundown Concert Series, replete with breathtaking sunset-hued skies along Wilmington’s Riverwalk, and jazz in the historic Bellamy Mansion’s courtyard. Beaches – The island beaches of Carolina Beach, Kure Beach and Wrightsville Beach provide ocean breezes to go along with your toe-tapping. 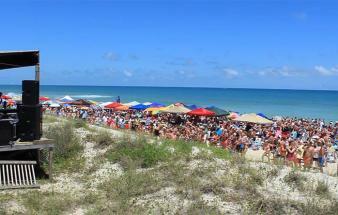 Whether you’re looking for rock, Reggae, blues or Americana, Ocean Grill & Tiki Bar in Carolina Beach has you covered. Resting on the remnants of a wooden pier – that doubles as a stage - the tiki bar is accessible from the Ocean Grill’s dining area or directly from the beach. Likewise, the Carolina Beach Boardwalk gazebo features a variety of live weekly concerts during the summer and at other times throughout the year. Just a few minutes south in Kure Beach, the Fort Fisher Air Force Recreation Area stages annual festivals and a free summer concert series. Kure Beach&apos;s Ocean Front Park & Pavilion offers free live music on select Sundays, May through October. Visitors to Wrightsville Beach can enjoy live music beachside on the Crystal Pier at Oceanic Restaurant or dockside at Bluewater Waterfront Grill, overlooking the Atlantic Intracoastal Waterway. Just over the bridge, sprawling ancient live oaks and colorful blooms provide a lush backdrop for Airlie Gardens’ Summer Concert Series. Or, pack a picnic, bring a chair and head to Wrightsville Beach Park for the free Sounds of Summer concert series. If customary indoor venues are more your game, Wilmington has outstanding performance halls. Housing an auditorium with state-of-the-art technology, consider catching a concert, Broadway show or symphony production at The Wilson Center. 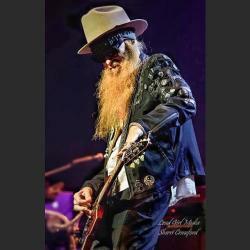 Since first raising its curtain in 2015, the 1,500-seat theater in Wilmington’s River District has hosted acts such as ZZ Top, Keb’ Mo,’ and Tanya Tucker. Just a few blocks south, you’ll find Thalian Hall Center for Performing Arts, one of the oldest theaters in the U.S. Operating since 1858, this beautiful opera-style theater has three stages, and as legend has it, a ghost or two. In midtown, there’s Kenan Auditorium on the UNCW campus, where you can catch internationally-acclaimed and community performers. Step off the beaten path to discover avant-garde venues from the river to the sea. Get your ‘do done, browse art, and hear a bluesy band, all at Beale Street Barber Shop. Over at Cameron Art Museum you may hear rockabilly or Beethoven, while the listening room at Ted’s Fun on the River (an official WoodSongs Coffeehouse) boasts live music five nights a week. And for a show you won’t soon forget, grab tickets to see a national touring band at Brooklyn Arts Center, a refurbished century-old church with stunning stained-glass windows. Wilmington and its island beaches boasts countless eateries, breweries and watering holes that serve live music, in addition to delicious food or drink. Restaurants - Beach-area restaurants like 1900 Restaurant & Lounge deliver live music and DJs on various nights of the week, with nearby Grand Cru featuring lighter music with its tapas and wine menus. Or, hop over the Wrightsville Beach drawbridge to EAST Oceanfront Dining at Blockade Runner Resort and Oceans at Holiday Inn Resort for some acoustic stylings. 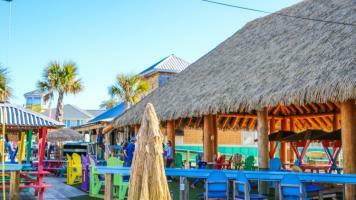 Rock-n-roll covers come to life at Carolina Beach’s SeaWitch Café & Tiki Bar, while Reggae often rules at The Lazy Pirate. 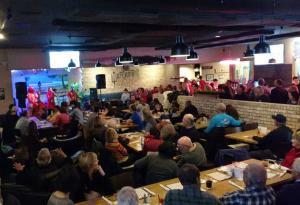 Meanwhile, dozens of Wilmington restaurants team with live tunes, running the gamut from funk and bluegrass to hard rock, indie rock and retro. For music with a stunning view of the riverfront, it’s hard to top the rooftop bar at Reel Café. Head north along US 17 and the kids are free to frolic on Ogden Taproom’s vast lawn while local musicians play on the eatery’s back deck. For more ideas, click on the Wilmington and Beaches restaurant page. Bars –Wilmington is home to numerous bars that double as small venues, such as The Whiskey and Calico Room in the historic river district. In midtown, Reggie’s 42nd Street Tavern, the Rusty Nail Saloon and Satellite Bar & Lounge are solid suggestions. When combined, you can catch nearly every musical genre. The Palm Room in Wrightsville Beach is a locals’ favorite and Carolina Beach’s HopLite Irish Pub features live music on the weekends. 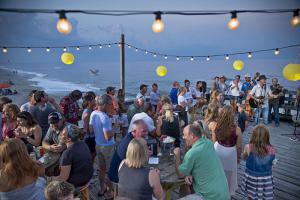 You can search for more options on the Wilmington and Beaches nightlife page. Breweries & Bottleshops – Craft beer and live music go hand-in-hand, and Wilmington is among the nation’s growing brewery hotspots. 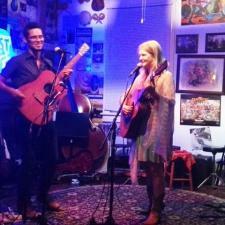 Waterline Brewing Co., Wrightsville Beach Brewery, and Waterman’s Brewing Company, regularly host local musicians. The latter expanded recently with a fundraiser/show featuring national act Dumpstaphunk, with its blues-jazz-funk-rock fusion. Bottleshops such as Palate and The Brewer’s Kettle have live music on certain nights of the week, among other options along the Wilmington Ale Trail. Insider Tip — While in town, pick up a free copy of Encore magazine for weekly entertainment listings. 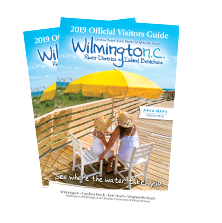 With mild winters and sultry summers, Wilmington and its island beaches hold a variety of festivals year-round. Some are devoted solely to music, including the Pleasure Island Seafood, Blues & Jazz Fest (Oct); North Carolina Jazz Festival (Feb); East Coast Shag Classic (Feb); and Cape Fear Blues Festival (June). 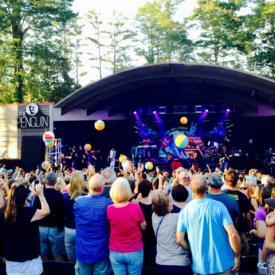 Also in June, the Carolina Beach Music Festival was among TravelChannel.com’s 2018 roundup of “10 Terrific U.S. Beach Festivals to Check Out This Season.” Others, like the North Carolina Azalea Festival in early April, include evening concerts with past touring acts such as The Avett Brothers, Carrie Underwood, Lynyrd Skynyrd, Snoop Dogg, Duran Duran, Ludacris, Billy Currington, and more. Meanwhile, fall’s Riverfest in early October features rotating sets by local and regional musicians throughout the day. As you can see, the mix of venues, plus local, regional and touring bands are sure to satisfy nearly every musical craving. With these insider tips, you can now get a taste for yourself as you experience the vibrant music scene in Wilmington and its island beaches. Sherri Crawford is the owner of Loud Girl Media, specializing in creative and event services. As a journalist and former radio news anchor, she’s covered the gamut from breaking news and elections to entertainment news and celebrity musician interviews. As a photographer and photojournalist, Sherri specializes in events, portraits and concert photography. A former rock radio DJ, you can still find her commanding the mic as an event emcee and team trivia host in and around Wilmington. When not working, Sherri enjoys live music, traveling with her husband Matt, spontaneous kitchen dance parties and yoga. Follow her on Instagram @LoudGirlMedia.